Holi hai aur meetha toh banta hai! 🙂 (It’s Holi and we must have sweets) Wishing you all a very Happy festival of colours ‘Holi’! During Holi we usually make sweets from Mawa/Khoya (Dried or Concentrated Milk). This Holi too I made something out of Mawa/Khoya (Dried or Concentrated Milk) but it’s a Cake. 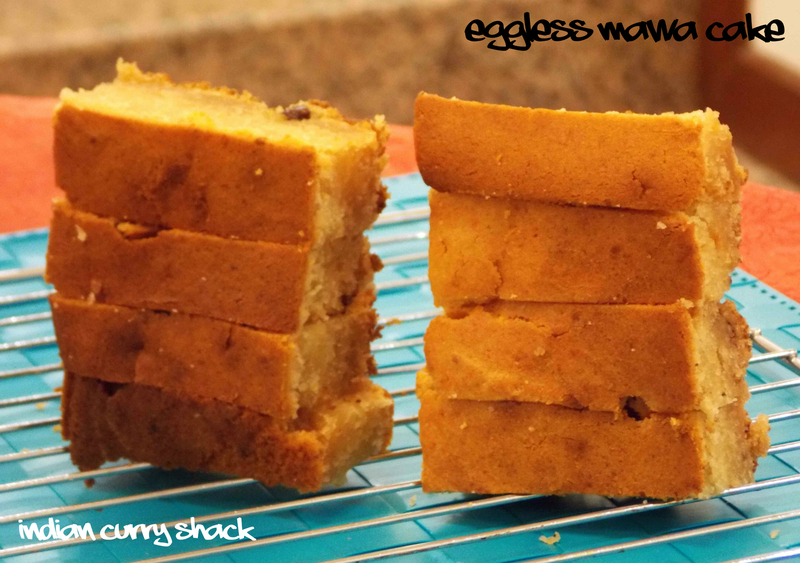 Relish Eggless Mawa Cake with your family and friends this Holi! Line a round baking tray with baking/parchment paper or grease with some oil and set aside. In a large bowl of your electric/hand mixer, add the butter and sugar and blend till fluffy. Now add crushed Mawa/Khoya (Dried Milk) and mix very well. Strain the wheat and plain flour with baking powder and baking soda directly into the bowl. Now add cardamom powder, milk and cream. Blend well to a batter. Use your spatula at intervals to gather the flour/ batter sticking on the sides of your bowl. Whisk until well incorporated. Preheat the oven. Drop the batter in the round baking tray (leaving 2-3 inches height on top). Bake at 180 degrees Celsius for 40-45 minutes. (Check after 40 minutes if the cake has started browning on top, to check if the cake is ready, just insert a tooth-pick in the cake and if it comes out clean then it is done, if not, bake for another 7-10 minutes). Bring the cake out. Let it rest on the tray for 10-15 minutes. Transfer the cakes to a wire rack and let it stay for 15-20 minutes. Yummy and mouthwatering eggless mawa cake is ready to be relished. I am loving your wonderful comments! 🙂 Really appreciate them! This is damn good Anugya ! Indeed! 🙂 Thanks a ton, Vidya!